In programming, even simple looking requirements can foreshadow some of the most complex code developers can create. Often the complexity is driven by factors that we, as developers, need to consider that the business defining the requirements do not. These factors normally include performance metrics like throughput, latency and demand on system resources. This article will explore how quickly the complexity of a simple task can grow, and how the TPL Dataflow library helps to tackle the complexity with an API that builds on the Task-based Asynchronous Pattern (TAP) that was introduced in .NET 4.5. To demonstrate the power of the Dataflow library, we’ll show how a completely custom asynchronous parallelized workflow that would likely have been over 1,000 lines of code can be condensed to less than 150 lines. Process any newly placed orders to our shipping services and update those orders with tracking numbers. The shipping service takes in multiple orders at once, so sending them in one at a time is inefficient use of the network, but sending them all at once will take some time, which will hold up resources until completed. We will need to batch the orders with a reasonable size. Also, if multiple shipping providers are supported, we may need to route the orders to more than one shipping service. Our class that takes in newly placed orders will have to employ some locking mechanism to make sure that the internal queue of orders is managed in a thread safe manner. If there are a lot of orders, processing these one by one may also cause the queue to grow larger and larger, eventually putting pressure on memory resources. Once all of the orders have tracking numbers, the DB has to be updated. This could take time and there’s no reason that other orders shouldn’t be sent to the shipping services while these orders are being saved to the database. Idle hands are the devils playthings after all. Immediately our simple solution now involves batch queuing, concurrent processing and coordination of threads through synchronization objects. The full weight of how much code you’ll actually have to write is upon you. It’s not that any of these problems are insurmountable, but the amount of code that will be generated, time spent testing and the complex, error prone nature of the code will end up determining how long it will take to put a get a solution like this into production. Looks like it will be a long day, better refill that coffee! 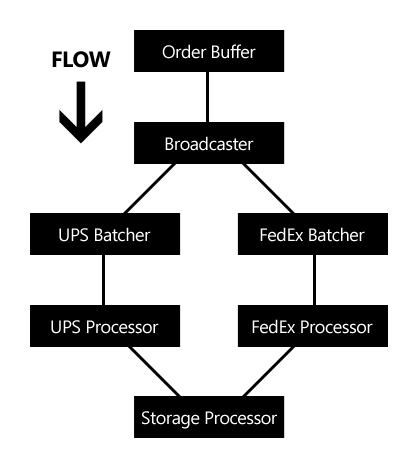 Buffering Blocks: These blocks essentially receive and store data so that it can be dispatched to one or more other target blocks for processing. All of these blocks guarantee order in message delivery, with the exception of the WriteOnceBlock<T> which essentially only allows the first message received to be dispatched to its linked targets. Execution Blocks: Blocks that fall into this category take in a specified delegate that is run on each data object that is dispatched to it. The execution of the delegate is done asynchronously, which means that as data is received by these classes, the delegate is scheduled by the task scheduling engine of the TPL to be processed on a thread pool thread. All of these classes will by default process only one data element at a time, buffering the other data until the previous one completes, but each class has settings that allow you to specify the number of data objects that can be processed in parallel and the internals of the class handle the rest. Grouping Blocks: The classes that comprise this category tackle the need to aggregate data elements from one or more data sources. This can be done either by grouping data into sets to be processed as a batch, or synchronizing multiple outputs from other tasks running asynchronously to be processed by another component. If one of the blocks provided by the library doesn’t quite fit the bill, you can build your own custom component. The Dataflow library exposes three main interfaces that can be implemented in order to make your custom component compatible and composable with the built-in blocks. ISourceBlock<TOutput> is for components that will buffer and/or dispatch data elements to one or more target blocks, ITargetBlock<TInput> enables implementations to recieve and process, and IPropagatorBlock<TInput, TOutput> is for components that will act as both a source and a target component. If you want to build a wrapper class that utilizes an existing source and target component, the Encapsulate<TInput, TOutput> method can generate a propagator for you to simplify your implementation. While we won’t be covering each of the blocks of the library in depth, we will touch on a few of these blocks in more detail as we build our example. One interesting side-note about the TPL Dataflow library that Microsoft makes very clear is that it is not packaged as part of the .NET 4.5 framework. This means that you won’t have access to these classes without importing the library. This is easily done, however, with the Nuget Package Manager by either searching the online gallery for “TPL Dataflow” or in the CLI by typing “Install-Package Microsoft.Tpl.Dataflow”. In this example, we’re going to buffer our Order objects to be sent over to the shipping service to be given tracking numbers. The Order class is simple and just contains a list of OrderItem objects that contain a SKU. Since orders can be split into multiple shipments depending on availability of the items on the order, the tracking number will actually be assigned to each OrderItem by the shipping services. In this example, we are using the default settings, which means that the OrderBuffer can hold an unlimited number of Order objects. You’ll notice here that indeed I’ve told the BroadcastBlock<T> to just go ahead and send the same Order reference to each target that I might link to it going forward. In my case, this will be OK because I’m going to be filtering the messages that go to each target so that only the proper pipeline will be able to process each message. Read on to see how that’s done. Our shipping service can take in more than a single order at a time, and since the service requires a network call, processing each order sequentially increases network traffic and potentially the latency of the system. The BatchBlock<T> block is one of the Grouping blocks offered by the Dataflow library and can aggregate data elements automatically from one or more sources until it reaches the specified size. Once this happens, it will flush the batch of items all at once to any linked target. We’ll put one BatchBlock in place for each carrier and for this example we’ll batch 5 orders at a time for each one. This means that as orders come in, we’ll be queuing batches of 5 orders separately to be processed by the UPS or FedEx endpoint of the service. In this example, we can see that each BatchBlock takes in the limit for how many items to group before flushing to its targets. Also, we link the BroadcastBlock to both BatchBlock instances using the LinkTo method. One thing to point out here is the lambda being passed to the LinkTo method for our BatchBlock instances. The LinkTo method supports filtering data messages from the source block to the target blocks by taking in a Predicate function. In our predicate above, we’re dictating that only orders with the Carrier property set to CarrierType.Ups will be sent to the upsBatcher BatchBlock class. This gives us an easy way to control how data flows to the targets without having to put complex if/else logic or a factory pattern into each of the downstream execution blocks. Remember that order matters when you link targets to a source block. With the BroadcastBlock<T> we’re sure that all targets will get a chance to process the same message if the target passes the predicate, but with other Buffering blocks like the BufferBlock<T>, this is not the case, so if the predicate isn’t specific enough, you risk having the message sent to the wrong target. Also, note that in our example above, if we add support in the future for DHL, and fail to add another batcher to our target list for the broadcaster, the system will come to a complete stop because BroadcastBlock<T> must process messages in order and it can’t find a target to accept the data, which means that orders start backing up and either deplete your memory resources or cause your order processing to block. Now that we have a way to buffer our orders and batch them per carrier, we need to handle sending the orders to the shipping service to have tracking numbers assigned to each item on those orders. The shipping service will return results for multiple orders as well, but we’ll want to update each order to the database one at a time. To accomplish this, we’ll use the TransformManyBlock<TInput, TOutput>. This block is in the Execution category, which means that it can take data from one or more sources and execute a specified delegate on that object before dispatching the result to one or more targets. This particular block is very similar to the TransformBlock<TInput, TOutput> with one exception: The TransformManyBlock<TInput, TOutput> expects that the return type of the delegate be an IEnumerable<TOutput>, but when dispatching the output to the target blocks, it will send each item in the enumerable list one at a time. What this means is that even though our shipping service will be sending back one XML document with tracking numbers on items for multiple orders, our target component can just accept a single OrderItem and the block itself will handle the iterative dispatching of the Enumerable results to the target. // Simulates transformation of a list of Order objects into a service api model (ShipDetail). // Sends orders to a shipping service endpoint dependent on the specified carrier. Our first task is to initialize the TransformManyBlock<TInput, TOutput> instances and designate the delegate we want the block to run. In our case, we can reuse the same method because we’re also passing the carrier as a parameter, which will ensure that we can hit the appropriate endpoint on our shipping service. Notice that the PostToCarrierAsync method returns a Task<IEnumerable>. All execution blocks can perform synchronous or asynchronous execution depending on whether the delegate parameter returns an instance of a TOutput, or a Task<TOutput>. Since we’re using the asynchronous form of the delegate specification, the block will release its current thread back to the thread pool while we await the response from the service and then resume execution once the response is received. This allows the execution thread to be used for other task processing and results in a more responsive, efficient system. Best of all, the Dataflow library classes can manage the asynchronous calls while still being able to coordinate the data to and from other components your pipeline. // Simulates persistence of tracking numbers for each item to a database. //Simulate updating the order to the database. Notice that the Input type of the ActionBlock<T> is ItemTrackingDetail. Because it is linked as a target of a TransformManyBlock<TInput, TOutput>, the Enumerable output from the transform will be iterated from within that block and sent as individual objects to the ActionBlock<T>, reducing even further the amount of code we have to write to iterate the data ourselves. The other thing to notice is that the ActionBlock<T> constructor is being passed an instance of ExecutionDataflowBlockOptions that specifies a MaxDegreeOfParallelism of three All execution block classes can be passed an instance of the ExecutionDataflowBlockOptions class that lets you specify how the TPL will parallelize and schedule the delegate to run. In our case, we are specifying that at most three calls to the database persistence delegate can be run in parallel at any given time. Similar to the TransformManyBlock<TInput, TOutput>, the persistence delegate also makes use of the asynchronous delegate overload, which maximizes the productivity of the thread pool. The linking stage is straightforward as well, with both transform block instances simply linking to the new ActionBlock<T> instance. Since each Dataflow block component is technically running code on the thread pool at one time or another throughout the course of the pipeline, it’s necessary to let each component know that it can finish up what it’s doing and release its resources for good. All DataflowBlocks have a Complete method that will prevent additional data from being received. Once complete is called, any data elements that are in the block’s buffer are processed and dispatched to any linked targets, upon which the block ceases its execution and releases any thread pool resources it was holding. Since all Dataflow blocks run asynchronously, they expose a Completion property that returns a Task object representing the execution state of the block instance. We can use this to set continuation delegates on all components in our Dataflow network such that they can all complete at the proper time. The example requirement above could have been implemented as a recurring task that pulls in all new orders that were placed since the last time the task executed. Using the Dataflow library can help you simplify complex pipelines or execution logic into linked Dataflow blocks that can help keep resource usage down and significantly reduce the amount of code that needs to be written and tested when creating custom tasks for the Taskmatics Scheduler. The scheduler itself utilizes the Dataflow library internally to manage its own complex flows for features like Live Tracing and task status notifications. Being a distributed system, the Taskmatics Scheduler relies on constant communication between the Agent processes running the tasks and the Coordinator component dispatching the tasks. The Coordinator relays all incoming messages both to the administration website clients that are connected as well as to a central data store for historical purposes. The ability to efficiently transmit these messages over the network between processes while maximizing the responsiveness of the application is critical to the overall performance of the system. To that end, we employ batching of messages over the network and asynchronous persistence to the data store using the BatchBlock<T> and ActionBlock<T> to simplify our logic and make it easier to maintain the code around that functionality. The classes of the TPL Dataflow library can be used to greatly simplify the amount of code needed to create large and complex asynchronous processes without the need to write all of the synchronization logic between the moving parts. Also, it reduces the amount of testing and debugging that has to be done due to having lots of complicated code to control the flow of data from start to finish. With the compound time savings that you get from using the Dataflow blocks, you might be able to get that complicated requirement done by lunchtime. Now go enjoy some coffee, you’ve earned it! Thanks Pamala! Glad you enjoyed it. Good article. It helps clarify what the TPL can do. One question that still confuses me, even though you touch on it at the end, is the completion. You mention you could use Taskmatic, I’m assuming, to setup a recurring task to run the pipeline. But that means it would have to get the next orders to process, I’m guessing not from the buffer block. But from some other queuing mechanism. Since sending complete on the buffer block prevents it from accepting anything else. Is it possible to just not send complete and have a long running instance? You are right that in the example I was highlighting how the pipeline can be executed by a recurring task, but you can also have the pipeline integrated into a windows service where it can listen or poll some source of data, like a queue, and only call complete in the handler for service shutdown. There’s nothing dictating when you call complete, it’s just good practice that you do it when you want to end the pipeline gracefully. How do I implement committing (PersistToDatabase) multiple orders (batch of orders) rather than one order at a time using ActionBlock or CustomBlock? There are a number of ways that this can be accomplished. 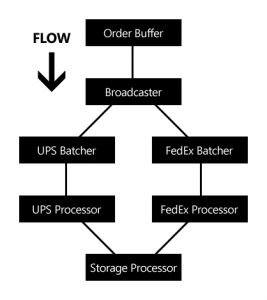 Using our example from the article, the easiest way would likely be to change the upsProcessor and fedexProcessor from TransformManyBlock to TransformBlocks. Then change the StorageProcessor from ActionBlock to ActionBlock (don’t forget to make a corresponding type change to the action delegate) and you’ll be able to persist the batch on a shared connection. Another way could be to introduce another BatchBlock which would be linked to from both the UpsProcessor and FedexProcessor blocks and use that to aggregate and feed the storageProcessor, which would still need to be modified to accept ItemTrackingDetail now. I would personally go the first route as it’s not ideal to reduce the batches to single elements just to aggregate them again later, unless for some reason you need a separate throttle for persistence vs. your other work. Thanks Dave, yes it did helped me. I have implemented your first recommendation, and it worked. I have also implemented timer with TriggerBatch method to flush out the remaining from the BatchBlock, I must say I struggled little bit. May I suggest Dave that if you could update this blog with persisting multiple orders and TriggerBatch would be great for the any new players, basically this covers a decent percentage of in the real world implementations. How to integrate transactions in the system? What if I I have to read source orders from some queue? Since message once read will be lost if something bad happens down the process pipeline ..say shipping service throws exception..or persist operation fails..how I can execute complete process as single transaction?